Les Contamines is a quiet unspoilt village at the head of the Montjoie valley and is dominated by Mont Blanc. 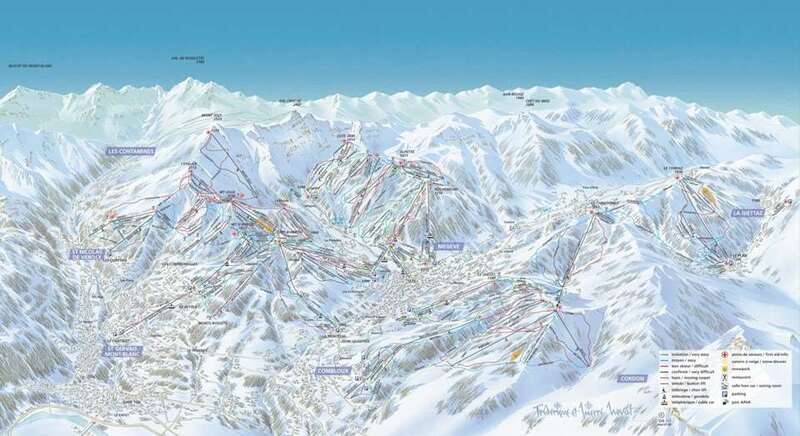 It boasts 120km of piste suitable for all standards but with an emphasis for intermediates, although there are some interesting black runs and plenty of off piste. Its snow record is reliable and as most of the slopes are above 1800m and face north and north-east, they retain their snow when other nearby resorts are suffering. Off-piste you can also find the delights of dog-sledding and ice-climbing. The resort itself is attractive with wooden chalets, old fashioned hotels and an old church, with night life centred around the bars and restaurants. Considering its proximity to the international resorts of Chamonix and MegÃ¨ve, it has a genuinely French atmosphere. I had an amazing time at Les Contamines last winter. I was traveling with my family and we appreciated the fact that this ski resort offers various opportunities for different levels of skiers and snowboarders. The resort boasts great sunshine and excellent natural snow conditions. The slopes wind down between glens and dales, wide runs, pine forests chalets and old farm buildings. The village nestles at the foot of Mont-Blanc, the higher slopes offering magnificent views, the lower areas tree-lined skiing. What we enjoyed the most were the incredible views of the Mont-Blanc. It’s a beautiful ski resort for ski holidays in France.